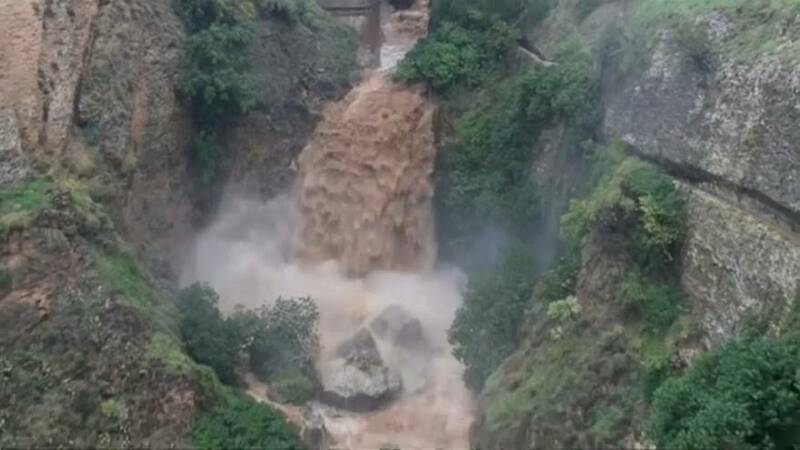 Heavy rains hit the southern Spanish province of Malaga dangerously swelling the water levels of the Guadalevin river. Video shot in El Tajo gorge which divides the historic town of Ronda shows torrents of brown water tearing through the valley after plummeting from a waterfall beneath the 18th century Puente Nuevo, one of three bridges spanning the river in the town. Ronda town council said emergency services had been called to more than 70 incidents in the first few hours after the overnight rain swept the area. The heavy rainfall forced hundreds of people from their homes across southern Spain with Malaga province among the worst affected. Almost 400-millimetres of rain fell in 24 hours in the town of Ardales, 62-km from the main city of Malaga alone, according to the regional government's environmental department. Further south, Spain’s meteorological agency Aemet withdrew a weather warning for the island of Fuerteventura on Friday following severe rainfall in the region that had prompted business and road closures. Andalusia and parts of Extremadura in the south of Spain expected heavy rainfall to continue. A yellow weather warning was put in place for those areas. This footage shows water moving rapidly across roads on the island of Fuerteventura.